The metropolitan region of Chennai is governed by the Corporation of Chennai. The corporation is headed by a mayor and a deputy mayor. There are a total of 155 councillors directly elected to the corporation, each representing a ward. The Mayor and Deputy Mayor preside over about ten Standing Committees. The municipal corporation takes care of the civic functions of the metropolis. 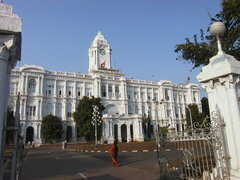 Chennai the also houses the administrative and legislative departments of the government of Tamil Nadu. There are housed in the Secretariat Buildings, part of the Fort St George campus. The Madras High Court, whose jurisdiction extends across Tamil Nadu and Pondicherry, is also located in the city. Chennai has three Parliamentary constituencies - Chennai North, Chennai Central and Chennai South. The current MPs are C Kuppusami, Dayanidhi Maran and T R Baalu. Chennai elects 18 MLAs to the state legislature.